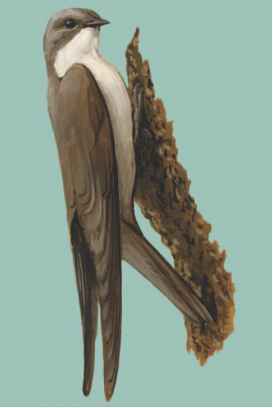 Physical characteristics: Crag martins are an average of 5 in (14 cm) in length. They are brown on top with a dusky color on the throat and belly and dark under the wing. When they fan their squared tails, white spots are visible. Geographic range: The crag martin breeds in mountainous areas of Europe and Asia, and migrates to the Middle East and Africa. Spain and Portugal have the largest European population, the birds are also found on some Mediterranean islands. Some varieties of crag martin are resident, meaning that they do not migrate. Habitat: Crag martins prefer to breed in mountainous areas, but like other mud-nest dwelling swallows, can be found in virtually any biome that has a plentiful insect population and offers supplies for nest building during breeding season. Crag martin mud nests are open and are constructed under cliff edges or human-made overhangs. Diet: The crag martin feeds on flying insects. Behavior and reproduction: The female crag martin incubates her clutch of three to five eggs. 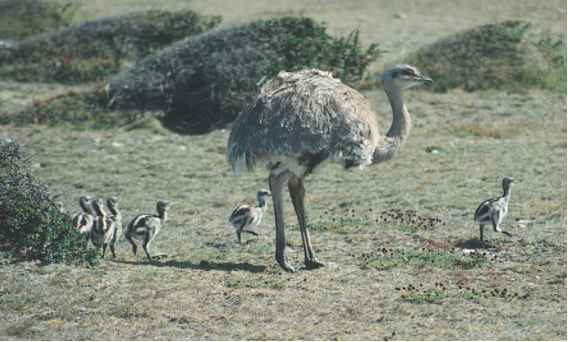 Once the eggs are hatched, both parents feed the chicks. Crag martins and people: Habitat destruction through development could negatively impact the crag martin, but like other mud-nesters of the swallow family, the species has proven itself very adaptable by building their homes on humanmade structures. Alderfer, Jonathan. "Swallows." In Reference Atlas to the Birds of North America. Edited by Mel Baugh-man. Washington, DC: National Geographic Press, 2003. Milius, S. "Birds May Inherit Their Taste for the Town." Science News (Dec 23, 2000): 406. "Barn Swallow." All About Birds. Cornell Lab of Ornithology. http:// birds.cornell.edu/programs/AllAboutBirds/BirdGuide/Barn_Swallow_dtl. html (accessed on May 28, 2004). "Swallows: Barn Swallows in Battery Pensacola." National Park Service: Gulf Islands National Seashore. http://www.nps.gov/guis/extended/ FLA/Nature/Swallow.htm (accessed on May 28, 2004). "Attracting and Managing Purple Martins." Purple Martin Conservation Association. http://www.purplemartin.org/main/mgt.html (accessed on May 29, 2004).